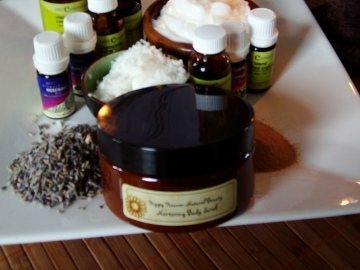 A delightfully luxurious mix of jojoba, macadamia, sweet orange and lavender essential oils, which feels exquisite to use. Revitalise�the appearance of the skin with our�natural, organic, exfoliant designed to gently polish your skin. A 100% natural sugar scrub, made using only organic ingredients. Apply in the shower to entire body and massage over skin for a smooth, healthy looking appearance. The addition of sweet orange essential oil leaves the skin feeling refreshed and revived. Small amounts may also be applied to the facial area and gently massaged before rinsing.